Christmas dinner in Australia is much like the Thanksgiving feast in the US. Although often our menu is quite different, the idea of the whole family getting together for a scrumptious meal is what it’s all about. Setting the table for said lunch or dinner has always been one of the jobs I’ve had the pleasure of completing on Christmas Eve – and getting it all done the night before really takes the pressure off Christmas day! 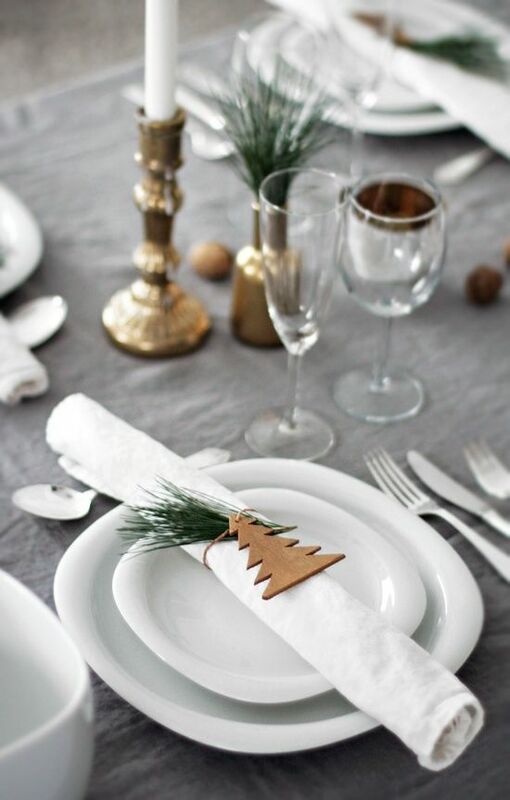 While keeping it practical is important, the Christmas table truly can be as simple or out there as you choose. From using masses of candles, to Christmas wreaths, miniature trees or just an array of festive colours, anything goes when setting the Christmas table. For many years, I have simply decorated our table by sneaking some décor off the tree or from around our home, so making the the table festive can also be easily done at the last minute and on a very friendly budget. This year I will only be setting the table for myself and my husband so it will be a little smaller than past years, but I’m sure as it grows each year it will tell new stories and create new fond memories. As I’m only setting a table for two, I couldn’t help but indulge in researching all sorts of tables. Just the thought of them notched my festive feelings up another level and has given me some fresh inspiration for what I’ll be creating tonight. Below are some ideas I’ve taken and am hoping to incorporate into our table this year. 1. Using height – Using cake plates for decorations or food will help create more space and give your table depth and more interest. Just remember not to go too high so that you can still make eye-contact with your favourite person on the other side! 2. Thinking outside the box – using non-traditional placemats like these tree slices is another beautiful way to add warmth and character. Mixed in with lots of candles and the greenery this table is a beautiful twist on a traditional Christmas set-up. 3. Trees & Baubles – literally taking the idea of Christmas decorating from the tree to the table, this setting really brings a little Christmas magic. Place settings – Okay, okay what really drew me to this was the gold and pinecones but I couldn’t do a post like this without the mention of place settings! When you’re having a big family get-together, these can be more important than you think. Ensuring Aunt Kate who’s not talking to Uncle Pete is not sitting next to each other can mean the difference between a wonderful feast or an awkward dinner. 5. Simplicity – I saved the best for last! Looking like the easiest to create, but often the most difficult, a simple table settle says it all with elegance and subtle hints to the festive season. The soft grey and gold go together like bread and butter, combined with the natural evergreen tones and fresh white, this table has been well thought out and is perfectly styled.